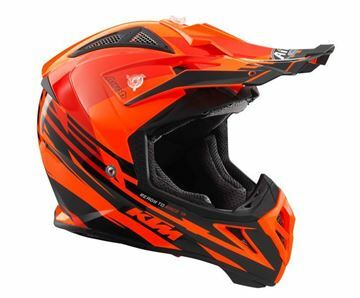 oranje aviator 2.2 helm Race-tested offroad helmet. Elaborate ventilation system. Ventilation openings protected with grilles additional covers supplied. Removable, washable, moisture-wicking, antibacterial inner lining and cheek pads. Optimum safety and fit thanks to three different shell sizes. Double D-ring fastener. Emergency help tabs (removable cheek pads). 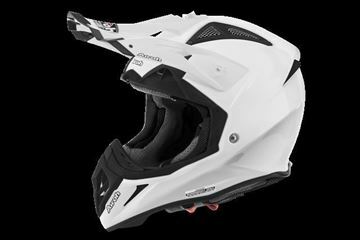 Helmet edge specially optimised for neck brace. Weight 950?g (?50?g). 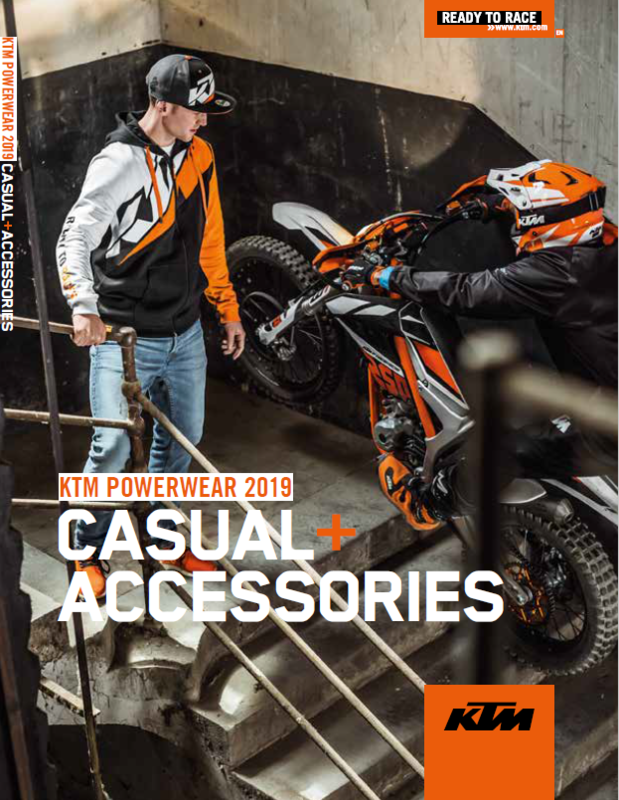 Made exclusively for KTM by Airoh. 50 % Kevlar / 50 % carbon . 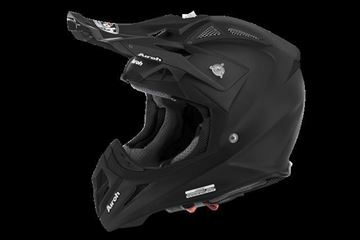 AIR-H-AV2211 ( )Helmet Offroad 'AVIATOR 2.2' Color Black matt ( )Aviator 2.2 represents the evolution of the Aviator 2.1, the champion helmet with which Airoh® has soared to the top spot of the podium in off-road disciplines, reaching the sports headlines.The helmet is available in two different shell sizes and is made with quality materials, 100% Carbon Kevlar, making it one of the lightest and best performing helmets of its class. The strengths in this new version are the lightness, which is implemented further, the expanded field of vision, the new vent chin bar, the new rear spoiler and the new peak that provide maximum protection.Great care has been taken for the inner lining that has been manufactured and designed with the latest materials ensuring optimal ventilation and breathability for those who practice sport at the highest competitive levels. Aviator 2.2 is equipped with a dust filter, which will prove a good ally during your days off-road and the emergency system for the release of cheek pads (AEFR).Also rich endowment of accessories that provide the Kit Go-Pro®, covers for the vents used in the event of rain or mud, the extended peak, the kit screws and the tool kit that allows you to play in total autonomy all these adjustments. Airoh® is also proud to offer a product to the public that is completely identical to that used by our champions. 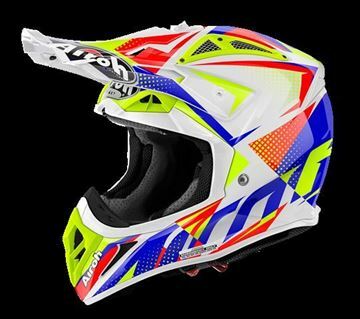 AIR-H-AV2214 ( )Helmet Offroad 'AVIATOR 2.2' Color White gloss ( )Aviator 2.2 represents the evolution of the Aviator 2.1, the champion helmet with which Airoh® has soared to the top spot of the podium in off-road disciplines, reaching the sports headlines.The helmet is available in two different shell sizes and is made with quality materials, 100% Carbon Kevlar, making it one of the lightest and best performing helmets of its class. The strengths in this new version are the lightness, which is implemented further, the expanded field of vision, the new vent chin bar, the new rear spoiler and the new peak that provide maximum protection.Great care has been taken for the inner lining that has been manufactured and designed with the latest materials ensuring optimal ventilation and breathability for those who practice sport at the highest competitive levels. Aviator 2.2 is equipped with a dust filter, which will prove a good ally during your days off-road and the emergency system for the release of cheek pads (AEFR).Also rich endowment of accessories that provide the Kit Go-Pro®, covers for the vents used in the event of rain or mud, the extended peak, the kit screws and the tool kit that allows you to play in total autonomy all these adjustments. Airoh® is also proud to offer a product to the public that is completely identical to that used by our champions. 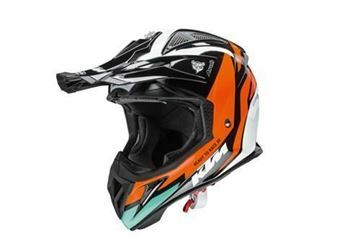 AIR-H-AV22BE18 ( )Helmet Offroad 'AVIATOR 2.2' Begin Gloss ( )Aviator 2.2 represents the evolution of the Aviator 2.1, the champion helmet with which Airoh® has soared to the top spot of the podium in off-road disciplines, reaching the sports headlines.The helmet is available in two different shell sizes and is made with quality materials, 100% Carbon Kevlar, making it one of the lightest and best performing helmets of its class. The strengths in this new version are the lightness, which is implemented further, the expanded field of vision, the new vent chin bar, the new rear spoiler and the new peak that provide maximum protection.Great care has been taken for the inner lining that has been manufactured and designed with the latest materials ensuring optimal ventilation and breathability for those who practice sport at the highest competitive levels. Aviator 2.2 is equipped with a dust filter, which will prove a good ally during your days off-road and the emergency system for the release of cheek pads (AEFR).Also rich endowment of accessories that provide the Kit Go-Pro®, covers for the vents used in the event of rain or mud, the extended peak, the kit screws and the tool kit that allows you to play in total autonomy all these adjustments. Airoh® is also proud to offer a product to the public that is completely identical to that used by our champions. 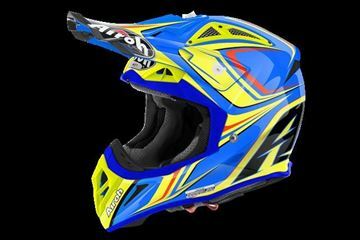 AIR-H-AV22EG18 ( )Helmet Offroad 'AVIATOR 2.2' Edge Blue gloss ( )Aviator 2.2 represents the evolution of the Aviator 2.1, the champion helmet with which Airoh® has soared to the top spot of the podium in off-road disciplines, reaching the sports headlines.The helmet is available in two different shell sizes and is made with quality materials, 100% Carbon Kevlar, making it one of the lightest and best performing helmets of its class. The strengths in this new version are the lightness, which is implemented further, the expanded field of vision, the new vent chin bar, the new rear spoiler and the new peak that provide maximum protection.Great care has been taken for the inner lining that has been manufactured and designed with the latest materials ensuring optimal ventilation and breathability for those who practice sport at the highest competitive levels. Aviator 2.2 is equipped with a dust filter, which will prove a good ally during your days off-road and the emergency system for the release of cheek pads (AEFR).Also rich endowment of accessories that provide the Kit Go-Pro®, covers for the vents used in the event of rain or mud, the extended peak, the kit screws and the tool kit that allows you to play in total autonomy all these adjustments. Airoh® is also proud to offer a product to the public that is completely identical to that used by our champions. 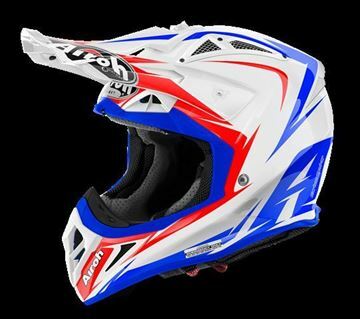 AIR-H-AV22EG38 ( )Helmet Offroad 'AVIATOR 2.2' Edge White gloss ( )Aviator 2.2 represents the evolution of the Aviator 2.1, the champion helmet with which Airoh® has soared to the top spot of the podium in off-road disciplines, reaching the sports headlines.The helmet is available in two different shell sizes and is made with quality materials, 100% Carbon Kevlar, making it one of the lightest and best performing helmets of its class. The strengths in this new version are the lightness, which is implemented further, the expanded field of vision, the new vent chin bar, the new rear spoiler and the new peak that provide maximum protection.Great care has been taken for the inner lining that has been manufactured and designed with the latest materials ensuring optimal ventilation and breathability for those who practice sport at the highest competitive levels. Aviator 2.2 is equipped with a dust filter, which will prove a good ally during your days off-road and the emergency system for the release of cheek pads (AEFR).Also rich endowment of accessories that provide the Kit Go-Pro®, covers for the vents used in the event of rain or mud, the extended peak, the kit screws and the tool kit that allows you to play in total autonomy all these adjustments. Airoh® is also proud to offer a product to the public that is completely identical to that used by our champions. 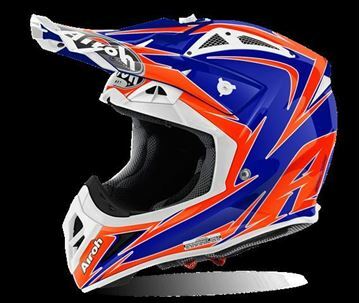 AIR-H-AV22FL18 ( )Helmet Offroad 'AVIATOR 2.2' Flash Blue gloss ( )Aviator 2.2 represents the evolution of the Aviator 2.1, the champion helmet with which Airoh® has soared to the top spot of the podium in off-road disciplines, reaching the sports headlines.The helmet is available in two different shell sizes and is made with quality materials, 100% Carbon Kevlar, making it one of the lightest and best performing helmets of its class. The strengths in this new version are the lightness, which is implemented further, the expanded field of vision, the new vent chin bar, the new rear spoiler and the new peak that provide maximum protection.Great care has been taken for the inner lining that has been manufactured and designed with the latest materials ensuring optimal ventilation and breathability for those who practice sport at the highest competitive levels. Aviator 2.2 is equipped with a dust filter, which will prove a good ally during your days off-road and the emergency system for the release of cheek pads (AEFR).Also rich endowment of accessories that provide the Kit Go-Pro®, covers for the vents used in the event of rain or mud, the extended peak, the kit screws and the tool kit that allows you to play in total autonomy all these adjustments. Airoh® is also proud to offer a product to the public that is completely identical to that used by our champions. 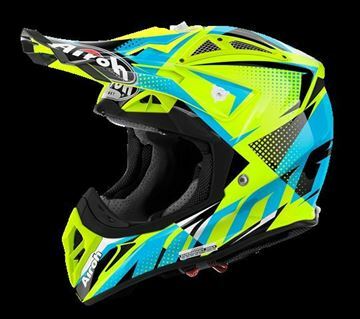 AIR-H-AV22FL31 ( )Helmet Offroad 'AVIATOR 2.2' Flash Yellow gloss ( )Aviator 2.2 represents the evolution of the Aviator 2.1, the champion helmet with which Airoh® has soared to the top spot of the podium in off-road disciplines, reaching the sports headlines.The helmet is available in two different shell sizes and is made with quality materials, 100% Carbon Kevlar, making it one of the lightest and best performing helmets of its class. The strengths in this new version are the lightness, which is implemented further, the expanded field of vision, the new vent chin bar, the new rear spoiler and the new peak that provide maximum protection.Great care has been taken for the inner lining that has been manufactured and designed with the latest materials ensuring optimal ventilation and breathability for those who practice sport at the highest competitive levels. Aviator 2.2 is equipped with a dust filter, which will prove a good ally during your days off-road and the emergency system for the release of cheek pads (AEFR).Also rich endowment of accessories that provide the Kit Go-Pro®, covers for the vents used in the event of rain or mud, the extended peak, the kit screws and the tool kit that allows you to play in total autonomy all these adjustments. Airoh® is also proud to offer a product to the public that is completely identical to that used by our champions. 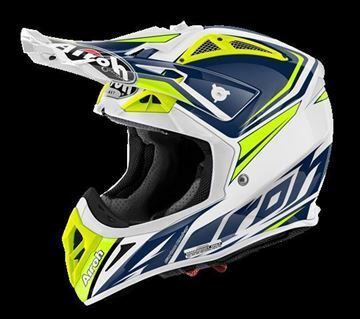 AIR-H-AV22FL38 ( )Helmet Offroad 'AVIATOR 2.2' Flash White gloss ( )Aviator 2.2 represents the evolution of the Aviator 2.1, the champion helmet with which Airoh® has soared to the top spot of the podium in off-road disciplines, reaching the sports headlines.The helmet is available in two different shell sizes and is made with quality materials, 100% Carbon Kevlar, making it one of the lightest and best performing helmets of its class. The strengths in this new version are the lightness, which is implemented further, the expanded field of vision, the new vent chin bar, the new rear spoiler and the new peak that provide maximum protection.Great care has been taken for the inner lining that has been manufactured and designed with the latest materials ensuring optimal ventilation and breathability for those who practice sport at the highest competitive levels. Aviator 2.2 is equipped with a dust filter, which will prove a good ally during your days off-road and the emergency system for the release of cheek pads (AEFR).Also rich endowment of accessories that provide the Kit Go-Pro®, covers for the vents used in the event of rain or mud, the extended peak, the kit screws and the tool kit that allows you to play in total autonomy all these adjustments. Airoh® is also proud to offer a product to the public that is completely identical to that used by our champions. 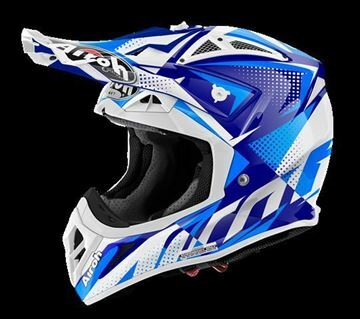 AIR-H-AV22RD18 ( )Helmet Offroad 'AVIATOR 2.2' Ready Blue gloss ( )Aviator 2.2 represents the evolution of the Aviator 2.1, the champion helmet with which Airoh® has soared to the top spot of the podium in off-road disciplines, reaching the sports headlines.The helmet is available in two different shell sizes and is made with quality materials, 100% Carbon Kevlar, making it one of the lightest and best performing helmets of its class. The strengths in this new version are the lightness, which is implemented further, the expanded field of vision, the new vent chin bar, the new rear spoiler and the new peak that provide maximum protection.Great care has been taken for the inner lining that has been manufactured and designed with the latest materials ensuring optimal ventilation and breathability for those who practice sport at the highest competitive levels. Aviator 2.2 is equipped with a dust filter, which will prove a good ally during your days off-road and the emergency system for the release of cheek pads (AEFR).Also rich endowment of accessories that provide the Kit Go-Pro®, covers for the vents used in the event of rain or mud, the extended peak, the kit screws and the tool kit that allows you to play in total autonomy all these adjustments. Airoh® is also proud to offer a product to the public that is completely identical to that used by our champions. 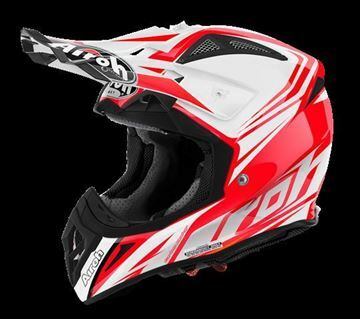 AIR-H-AV22RD55 ( )Helmet Offroad 'AVIATOR 2.2' Ready Red gloss ( )Aviator 2.2 represents the evolution of the Aviator 2.1, the champion helmet with which Airoh® has soared to the top spot of the podium in off-road disciplines, reaching the sports headlines.The helmet is available in two different shell sizes and is made with quality materials, 100% Carbon Kevlar, making it one of the lightest and best performing helmets of its class. The strengths in this new version are the lightness, which is implemented further, the expanded field of vision, the new vent chin bar, the new rear spoiler and the new peak that provide maximum protection.Great care has been taken for the inner lining that has been manufactured and designed with the latest materials ensuring optimal ventilation and breathability for those who practice sport at the highest competitive levels. Aviator 2.2 is equipped with a dust filter, which will prove a good ally during your days off-road and the emergency system for the release of cheek pads (AEFR).Also rich endowment of accessories that provide the Kit Go-Pro®, covers for the vents used in the event of rain or mud, the extended peak, the kit screws and the tool kit that allows you to play in total autonomy all these adjustments. Airoh® is also proud to offer a product to the public that is completely identical to that used by our champions.